^ a b "Legend of Mana". Electronic Gaming Monthly. EGM Media (123): 122–123. October 1999. ISSN 1058-918X. ^ a b c d e Bilyk, Andrew P. "Legend of Mana - Review". RPGamer. Archived from the original on 2015-10-17. Retrieved 2008-06-14. ^ a b c d e Vestal, Andrew (2000-06-07). "Legend of Mana (review)". GameSpot. CBS Interactive. Archived from the original on 2013-10-20. Retrieved 2008-06-14. ^ a b c d "Review: Legend of Mana". GamePro. IDG. 2000-11-12. Archived from the original on 2009-01-13. Retrieved 2008-06-14. ^ Tan, Jeremy (1999-12-25). "Legend of Mana review". RPGFan. Archived from the original on 2015-09-06. Retrieved 2014-09-04. ^ "Legend of Mana Cheats & Codes". IGN. Ziff Davis. Archived from the original on 2014-10-31. Retrieved 2014-09-04. ^ Square (2000-06-06). Legend of Mana. PlayStation. Square. Narrator: Nine centuries ago, the Mana Tree burned to ashes. The power of Mana lived on inside Mana Stones, enchanted instruments, and artifacts. Sages fought with each other for control of these last remnants of Mana. Then, after hundreds of years of war, as the power of Mana began to wane, those who sought it grew scarce, and the world returned to peace. ^ Studio BentStuff, ed. (1999-09-30). Seiken Densetsu: Legend of Mana Ultimania (in Japanese). DigiCube. pp. 1–14. ISBN 978-4-925075-64-0. ^ Gross, Mark (2000-11-16). "A Legend of Mana Analysis". RPGamer. Archived from the original on 2014-09-12. Retrieved 2014-09-11. ^ Square (2000-06-06). Legend of Mana. PlayStation. Square. Elazul: Another Jumi was murdered... this is horrible. Sandra, I will catch you one of these days! ^ Day, Ashley (February 2011). "Featured: The Secrets of Mana". Retro Gamer. Imagine Publishing (85): 24–31. ISSN 1742-3155. ^ Gantayat, Anoop (2006-10-06). "HAVOK For Mana". IGN. Ziff Davis. Archived from the original on 2015-07-20. Retrieved 2013-04-07. ^ Kawazu, Akitoshi. "Akitoshi Kawazu – Producer (Legend of Mana)". Seiken Densetsu Music Complete Book (Liner notes) (in Japanese). Square Enix. ^ "Square's New Legend". IGN. Ziff Davis. 1999-03-18. Archived from the original on 2015-12-15. Retrieved 2008-07-20. ^ Kennedy, Sam (1999-07-12). "Japan Prepares for Mana". GameSpot. CBS Interactive. Archived from the original on 2015-12-15. Retrieved 2008-12-14. ^ "Legend Of Mana To Be Told Early". Game Informer. GameStop. 2000-05-26. Archived from the original on 2000-10-02. Retrieved 2014-08-27. ^ "Square's First Summer RPG, Legend Of Mana, Ships". Game Informer. GameStop. 2000-06-06. Archived from the original on 2000-10-04. Retrieved 2014-08-27. ^ a b Jeriaska (2009-08-31). "Interview: Magical Planet - The Music of Hiroki Kikuta & Yoko Shimomura". Gamasutra. UBM. Archived from the original on 2015-10-17. Retrieved 2009-09-01. ^ Jeriaska; Kikuta, Hiroki (2007-06-16). "Hiroki Kikuta: Lost Files Regained". Square Haven. Archived from the original on 2014-01-17. Retrieved 2009-11-17. 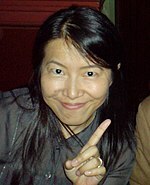 ^ "RocketBaby's Interview with Yoko Shimomura". RocketBaby. 2002. Archived from the original on 2011-07-16. Retrieved 2007-06-15. ^ a b Gann, Patrick (2000-10-15). "Seiken Densetsu: Legend of Mana OST". RPGFan. Archived from the original on 2015-09-09. Retrieved 2009-08-11. ^ 聖剣伝説　ＬＥＧＥＮＤ　ＯＦ　ＭＡＮＡ　オリジナル・サウンドトラック (in Japanese). Oricon. Archived from the original on 2014-03-16. Retrieved 2010-06-24. ^ "Drammatica". Square Enix. Archived from the original on 2015-06-10. Retrieved 2008-03-27. ^ Stahn, Mahn (1999-09-05). "Legend of Mana Products". RPGFan. Archived from the original on 2015-09-06. Retrieved 2008-06-07. ^ "Retrospective: Secret of Mana". Edge. Future plc. 2014-06-01. Archived from the original on 2014-07-15. Retrieved 2014-08-20. ^ Hill, Doug (2000-04-11). "Square announces a Summer of Adventure". RPGamer. Archived from the original on 2015-09-15. Retrieved 2008-06-07. ^ "New Square Millennium Collection Goods". IGN. Ziff Davis. 2000-09-11. Archived from the original on 2013-10-18. Retrieved 2008-06-17. ^ 聖剣伝説　レジェンドオブマナ　メイキングオブ [Legend of Mana - Making of Mana] (in Japanese). ASCII. 2000-09-26. ISBN 978-4-7561-3148-5. ^ 聖剣伝説 レジェンドオブマナ 全5巻完結 [マーケットプレイス コミックセット] (in Japanese). Amazon.com. Archived from the original on 2015-12-15. Retrieved 2014-08-29. ^ a b "Legend of Mana Reviews". GameRankings. Archived from the original on 2015-10-17. Retrieved 2008-06-11. ^ a b 聖剣伝説 レジェンド オブ マナ まとめ [PS] [Seiken Densetsu: Legend of Mana (PS)]. Famitsu (in Japanese). Enterbrain. Archived from the original on 2015-10-17. Retrieved 2015-12-15. ^ a b c d Smith, David (2000-06-06). "Legend of Mana". IGN. Ziff Davis. Archived from the original on 2015-10-17. Retrieved 2008-06-14. ^ a b Reyes, Francesca (August 2000). "Legend of Mana". Next Generation. Imagine Media. 2 (8): 94. ISSN 1078-9693. ^ "Dengeki PlayStation Sales Chart". PlayStation Official Magazine. Future plc (51). November 1999. ^ Carless, Simon (1999-08-06). "MGT Report "Litigation Time"". Gamasutra. UBM. Archived from the original on 2008-05-29. Retrieved 2008-06-10. ^ "1999 Top 100 Best Selling Japanese Console Games". The Magic Box. Archived from the original on 2014-12-15. Retrieved 2015-02-04. ^ "PlayStation Awards 2000". IGN. Ziff Davis. 2000-06-29. Archived from the original on 2012-07-10. Retrieved 2008-07-19. ^ "Legend of Mana Tops Sales Charts". IGN. Ziff Davis. 2000-06-16. Archived from the original on 2015-10-17. Retrieved 2008-06-07. ^ a b c Kennedy, Sam; Pfister, Andrew; MacDonald, Mark (August 2000). "Legend of Mana". Electronic Gaming Monthly. EGM Media (133): 149. ISSN 1058-918X. ^ Thomas, Damian (2000-06-20). "Legend of Mana review". RPGFan. Archived from the original on 2015-10-17. Retrieved 2008-06-14. ^ 「第4回日本ゲーム大賞」受賞作品一覧 (in Japanese). Computer Entertainment Supplier's Association. Archived from the original on 2015-04-11. Retrieved 2008-07-21. ^ Liu, Johnny (June 2000). "Legend of Mana review". Game Revolution. Net Revolution. Archived from the original on 2014-08-11. Retrieved 2008-06-14. ^ Steinman, Gary (April 2002). "Roll Call". Official U.S. PlayStation Magazine. Ziff Davis (55): 52. ISSN 1094-6683. ^ "Famitsu Weekly PlayStation Top 100". IGN. Ziff Davis. 2000-11-20. Archived from the original on 2015-05-10. Retrieved 2008-07-05. ^ "PSone Booksシリーズ発売タイトル一覧" (in Japanese). Sony Computer Entertainment. May 2002. Archived from the original on 2013-12-21. Retrieved 2008-07-06. ^ Winkler, Chris (2006-04-26). "Square Enix Adds 16 to Ultimate Hits Series". RPGFan. Archived from the original on 2015-10-17. Retrieved 2008-07-06. ^ Gutierrez, Rey (2011-03-20). "The Drop: Week of March 21st 2011 New Releases". Playstation.Blog. Sony. Archived from the original on 2015-02-09. Retrieved 2011-04-03.